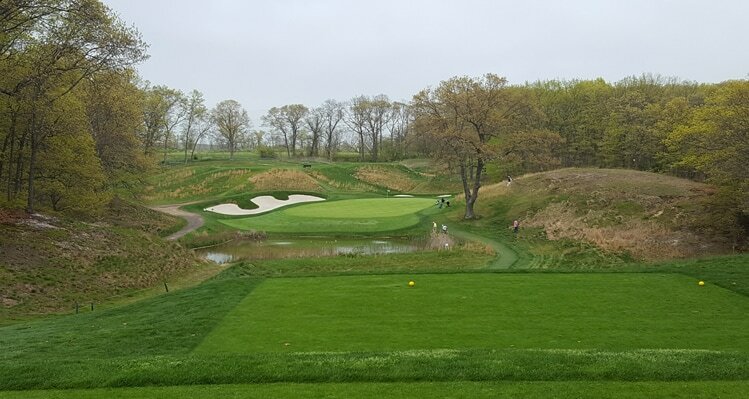 Bethpage Black Hole 1: If the golfer is nervous, this tee will add to that as it is right under the clubhouse staging area and plenty of eyes are on you. The hole itself foreshadows what is to come from the elevated tee box. 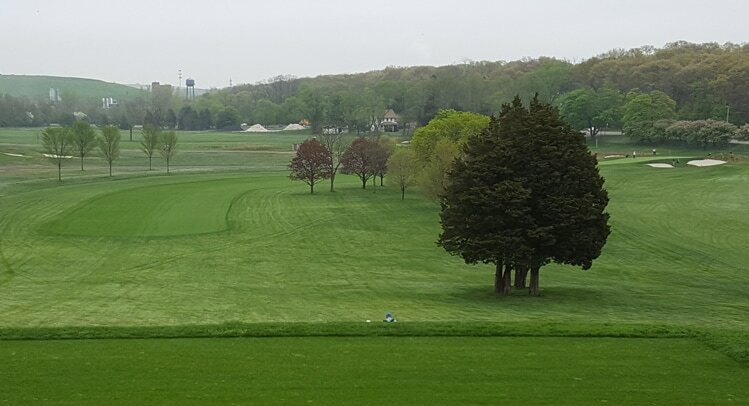 The fairway is tight, trees can cause trouble, the rough looks thick and the green is narrow with sand nearby. 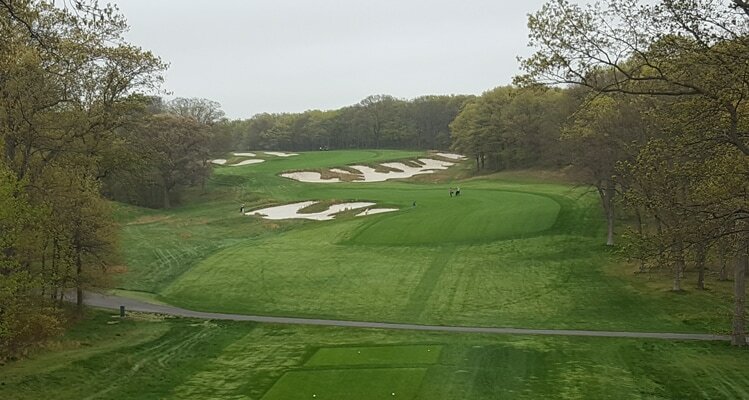 Bethpage Black Hole 2: This dogleg left par four is fairly short, but tight. Hitting the uphill green is much easier from the fairway and the huge bunkers right and left of the green really need to be avoided to make par or better. 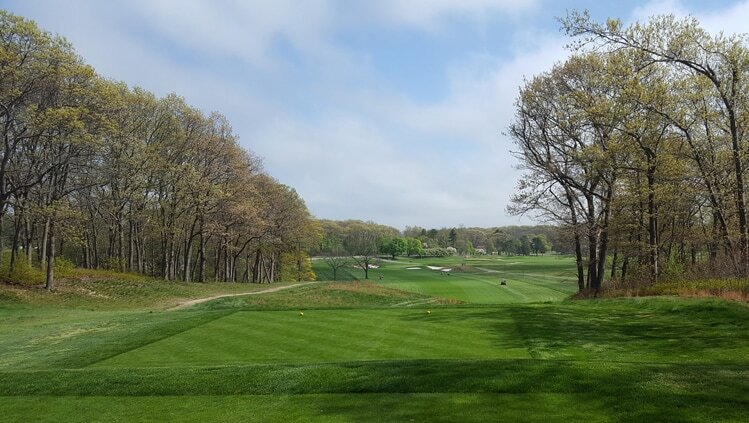 Bethpage Black Hole 4: This outstanding par five is short, but does not feel that way. The drive has to avoid the large bunker complex to the left and the second shot is one of the best in golf. Technically, a big drive could actually let the golfer go for the green in two but it will likely be a blind shot to the elevated green fronted by bunkers and with a steep slope down behind. Alternatively, the normal second shot still has to clear the brilliant cross bunkers. The farther right and in distance one goes, generally, the better the angle for the third into the green, but leaving the shot in the cross-bunker would spell absolute disaster. 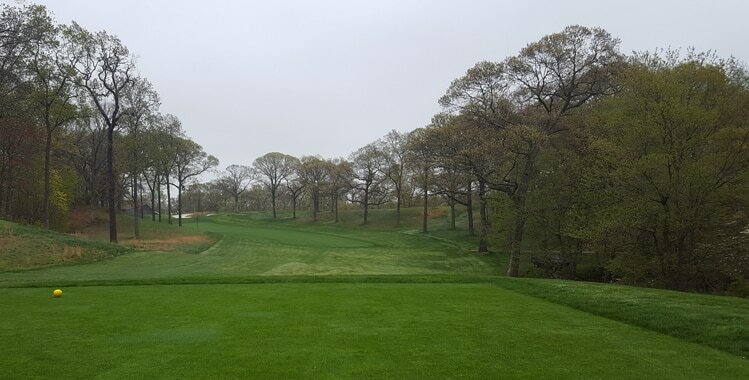 Bethpage Black Hole 5: This famous dogleg right par four has a fairway that slides between the massive bunker to the right and the tree lined hillside left. Biting off more of the dogleg leaves a much better angle to yet another elevated green with bunkers providing protection. 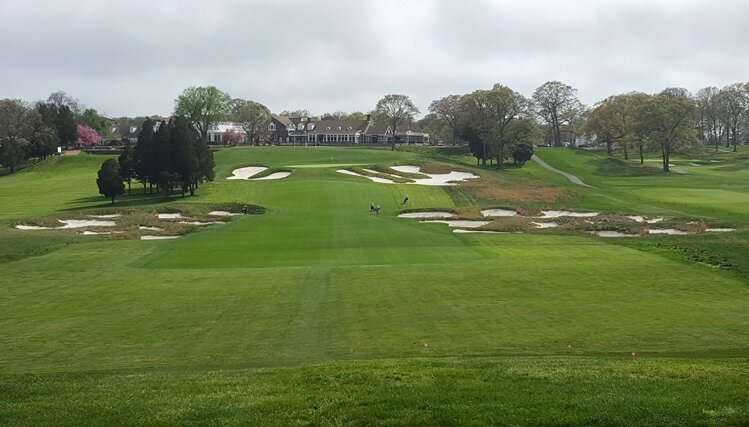 Bethpage Black Hole 6: This par four has a relatively flat drive that needs to find its way around or over the bunker on the left while avoiding the one right as well. A bomb could catch the downslope and leave a wedge approach but most shots will be played from mid-range, downhill to a green that is mostly surrounded by bunkers. 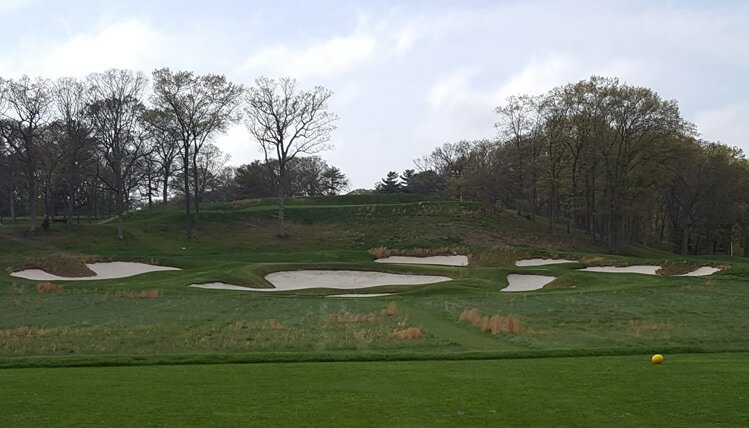 Bethpage Black Hole 7: Even the "boring" hole on the front nine still has a very pretty drive over the long grasses. However, this is the best chance to score as the fairway is generous and the hole is relatively flat with as little trouble as one will find on this course. Bethpage Black Hole 8: This par three is much more dangerous than it appears on television; it is downhill and the fronting lake is actually very close to the putting surface even though it is 10 yards short; this is because the front edge of the green rolls back down a shaved grass area with very little hope of the ball stopping; there is also a tier about two thirds of the way back on this hole, making it much more difficult than it seems on the screen. 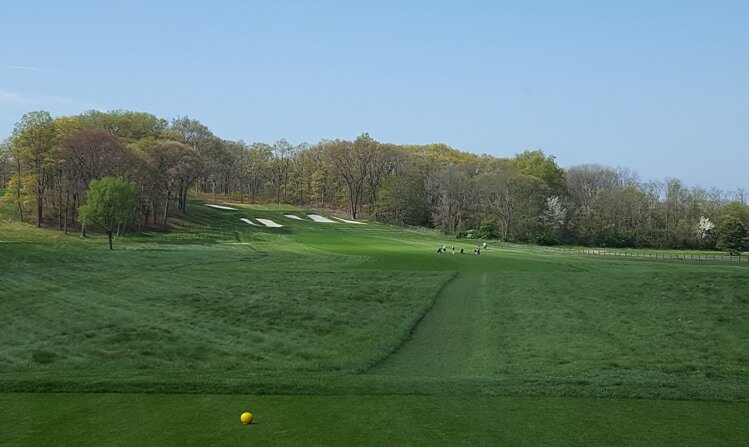 Bethpage Black Hole 12: After two tough par fours to open the back nine, it gets worse with the very long, dogleg left par four 12th. The player needs to carry the bunker on the left, preferably with a slight draw to hit the very narrow and angled fairway beyond. This can give them hope to wiggle a shot onto the green that sits between two large bunkers, and also that has some strong undulations due to a tier in its middle. Bethpage Black Hole 14: Seemingly benign, this short par three actually is that as long as the player finds the green. However, missing right is down a hill, left is in a bunker, long is in a collection area and short is in a deep bunker with limited opportunity to not hit it over the shallow green. Long story short...hit the green. 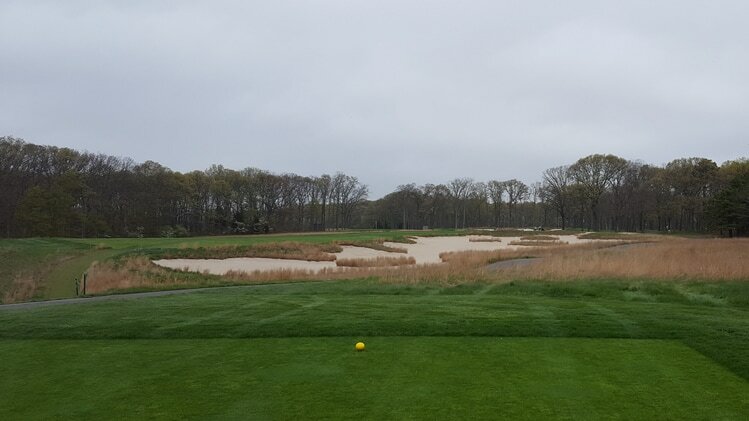 Bethpage Black Hole 15: In a course full of nasty par fours, this one takes the cake. The tee shot is relatively straight, but the fairway is cut very tight; there is also OB far right. The second shot, however, is way uphill to a green with deep bunkers in front, one to the left and steep hills all around. If the drive does not find the fairway, there is as close to a 0% shot of hitting the green as any hole on earth. 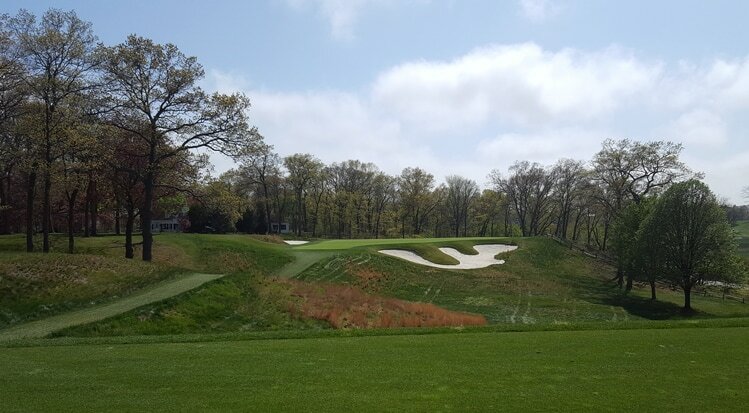 Bethpage Black Hole 16: Another long and mean par four, this one has a downhill tee shot but the player needs to hit it a long way and straight to leave a decent chance at hitting the green, which has bunkers on both sides. Bethpage Black Hole 17: The final par three is unusual in that the tee box sits in an unassuming and open area of the course with very little around it. Not short, and slightly uphill, the green is also not that deep, but is very wide. Thus, a high, long, soft shot is required to find the putting surface and avoid the myriad of sand surrounding. Bethpage Black Hole 18: The final hole is the shortest par four on the back nine and has an elevated tee box and elevated green; in between is a fairway that tightens the farther the drive goes between large bunkers, but, all things told, it's a cake walk compared to all the other holes on this nine.